Spending time in the wilderness may require that you can track time, use a GPS, have a compass to navigate in the area you are in, etc. Most survival watches provide these options and represent a great way to help you along your journey. Whether you’re lost or just wandering around, having the best survival watch on your wrist at all times may prove to be invaluable. Some such watches are useful simply because they don’t require batteries, and yet, keep track of time and days. Considering the features mentioned above, below we will discuss a collection of survival watches we consider being the best. Take a look and let us know what you think of our choices in comments. Special Features: barometer, thermometer, altimeter, and a compass. Indicates exact sunrise and sunset times, tide indication, alarm, world time, and has a timer. Description: All Casio survival watches are among the truly reliable ones. 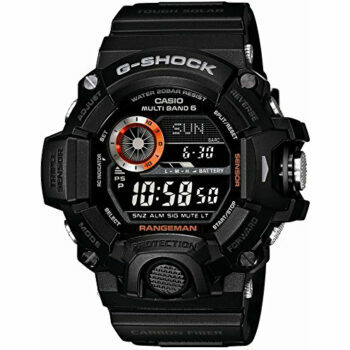 With this G-Shock Rangeman watch, you can enjoy a digital barometer which can detect a range of 260 to 1100 hectopascals. It also alerts you if there are pressure changes in the atmosphere. The thermometer’s temperature range detects a minimum of -10° to up to 60° C (14° to 140° F). The watch also features an altimeter and a compass. When it comes to power, the watch uses the solar energy to charge, so if you run out of battery juice, you can use the sun to charge the watch. This watch is ideal for any type of extreme survivalist, trekker, hiker or camper, and even for professional environmentalists who may spend weeks and months in remote areas or may be completely isolated. Most people are impressed at how rugged and stable this watch is. Its substantial weight gives it a more sturdy and ‘macho’ look. Many customers, who spend their working hours on the field, find it extremely reliable and have no concerns about its functionality. The only thing you may have to watch out for is that you will receive the manual in Japanese, but if you contact the manufacturer they can send you an English manual. This, of course, has nothing to do with the product itself, as so far is the only drawback some customers were concerned about. Description: Here is yet another amazing Casio product offering a ton of features that can be useful at any time and place, wherever you are. 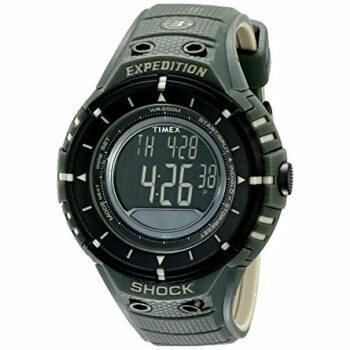 The Casio Gw7900b-1 G-shock Black Solar Sport Watch is as rugged as you may expect from a Casio survival watch and the batteries are powered by the sun and are rechargeable. The atomic clock is synced using radio waves. It updates the sunrise and sunset, including tidal changes. The watch is black because it’s most suitable for military personnel, so that you don’t stand out in the dark or if you’re hiding. The display is also dark and the numbers and letters are color-lit to help you distinguish the time and data on the display if you’re in the dark. When it comes to the solar charging, you may be glad to know that if you fully charge the battery it can last for almost 9 months, until it’s fully discharged. If you expose the watch now and then to sunlight, the solar panels will pick up light and will top-up the watch every now and then. This means that you can use the watch virtually at any time and always rely on it. There can be no risk for a critically low battery unless you stay in the dark for more than nine months. The atomic clock will update and sync every hour (during the night), so there’s no risk that you have the wrong time. The error can be one second only. As for the water-resistant feature, you can submerge underwater to up to 170 meters. That corresponds to 20 bars. 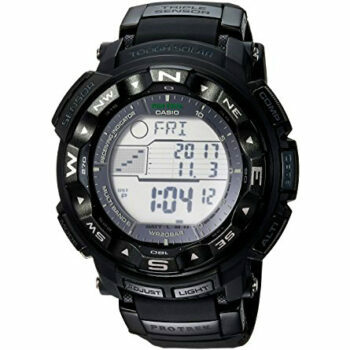 Although its features are similar to the previous Casio model, there are some negative reviews. Some customers shared that there may be problems updating the atomic clock, due to poor reception. Other customers experienced problems solar-charging the watch, even right out of the box. Related: There are non-atomic and non-negative display versions of this watch, so if you think you don’t need the atomic clock the GR7900KG-3CR will be great. Also if you can’t get used to the negative display you may want to check the G7900-1 G-Shock version. Description: Casio is definitely a leader manufacturer in making watches for decades and here’s yet another model of theirs. This Casio Protrek (Pathfinder) Prw2500-1a also has all the features and functions you may need in case you’re in an emergency situation or simply out in the wilderness. You will have access to information like moon phases, sunrise and sunset, including the necessary tidal phase. When it comes to the altimeter, it has been observed by some customers that it’s sometimes off and doesn’t accurately show the data. It may show one altitude number, but the map may show another, and this may be slightly confusing as to which data is correct. On the other hand, another customer experimented with it and learned that if you reset the altimeter during the night you will actually make it more accurate, since the pressure changes during the night and may upset the altimeter calculations. So, to avoid that, resetting it may help it work much better. This may be annoying to some users, but at least it’s working. If this isn’t bothering you, you may very well enjoy this watch. 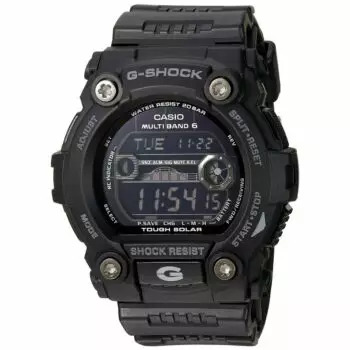 Of course, it’s not a quality G-shock model, like the above, but its functions are just as reliable, and it’s an accurate and powerful watch nonetheless. It’s much lighter than the G-shock. This may be preferred by some customers more than the heavier G-shock models. Description: Although we’re not talking about the Casio high-quality watches, this Timex T49612 Expedition Trail Series can still be a worthy competitor to Casio’s. Come military personnel went through training with Timex, and they still use it years later. This means that it’s still a durable and sturdy watch nonetheless. The watch can withstand rough handling. Of course, using it with care and attention won’t hurt, you can still be sure that it will remain as reliable as it was in the beginning. The watch relies on Quartz for the movement and has a reliable compass. The casing and the hand band are made of resin. The watch is suitable for use to a depth of maximum 200 meters (660 feet). What may be considered unique for this watch is that the company uses a lighting technique called Indiglo, created entirely by Indiglo Corporation, which is owned by Timex. The backlight employs different electro-luminescent lamps in order to provide different levels of lighting. Lastly, we must say that according to some customers this Timex watch is better in terms of shock resistance and durability in comparison to the Casio’s G-shock models. Most of these customers are in the military and undergo heavy training, so you should expect that the Timex watch goes through some harsh conditions and handling. Overall, very few people find problems with Timex and one of the most common is that for some people the light is a bit dim. And yet, as a whole, this watch is among the best and most durable of all, and considering the price, it almost comes as a freebie. For a review of the best compass watch, see our article on this topic for more options. 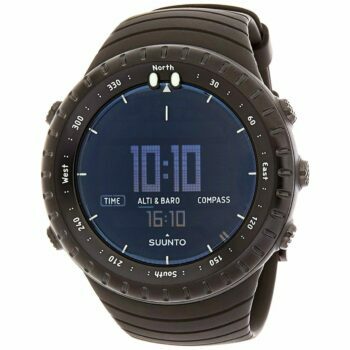 Description: One of the greatest things about this Suunto Core Wrist-top Computer Watch is that it filled to the brim with features. It has the usual barometer, altimeter, timer, world time, compass and many more features. It measures temperatures varying from -5° to 140° F and the altimeter can measure altitudes from -1,500 to 29,500 feet. In those cases when you ascend or descend too quickly, or if the hector Pascals change too radically within a few minutes, these measures will display automatically without you having to do anything. 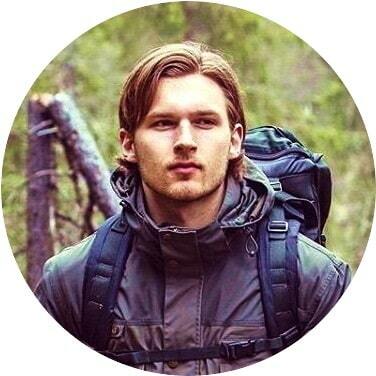 All the other features work as expected and are provided for those survivalists, mountaineer, climbers, hikers who spend days out there and need to be aware of all the changes in the weather and plan their route accordingly. Otherwise, the watch can’t withstand deeper than 100 feet of water, and also the shock-resistance is a bit under question according to some customers. This is because it’s not as rugged as the above-reviewed watches and is slightly lighter for a survival watch. Another thing to be aware of is that some customers report problems with the wristband and they have to change it now and then. For some reason the original wristband may not withstand some unpleasant weather conditions and fails with time, requiring replacement. This may be the only serious drawback, but overall, the watch itself works perfectly and is also beautiful. 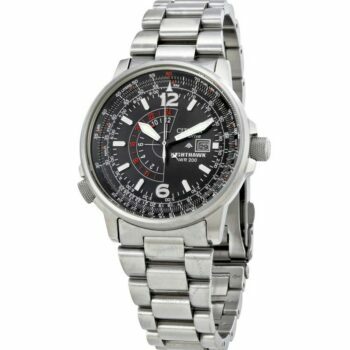 Not only that but the construction of this watch also makes it suitable for pilots or aviators, because it has a slide-rule bezel ring and a crown situated at the eight o’clock position. With the slide rule, you have the options to calculate and track the fuel consumption (or any land or airborne vehicle). You can perform complex calculations or convert different measurements from one unit to another. For those users who need to make even more complicated calculations (either nautical or involving aircraft), the slide rule can prove invaluable. The only feature that is lacking in this model is that it doesn’t have a stopwatch. According to one customer who happens to be a pilot, this is a big downside to this product. Also, the slide rule lacks backlighting in case you need to see the readings during the night or in the dark. This can be quite off-putting. If we have to give this watch an overall rate, it will get 9 out of 10 because of the slide rule. It is an incredibly useful feature that few wrist watches have, and it’s ideal for survival situations when you need to calculate certain things. Description: Here’s a watch that self-charges thanks to the kinetic technology used for this product. 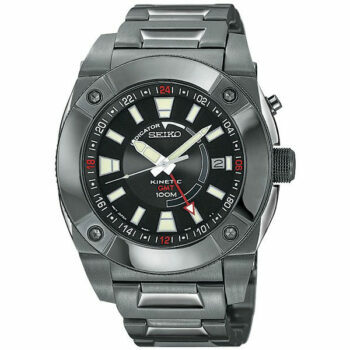 The Seiko Sun007 Kinetic Wrist Watch recharges using the energy created by your hand’s movement. This kinetic energy is then transformed into electricity and keeps the charge upon the watch. Thus, there’s virtually no need for sun exposure or manual winding or battery replacement. On top of that, once the battery is fully charged it may take up to 6 months before it needs to recharge. According to some customers who owned the watch for more than 10 years, the battery (called ‘capacitor’) will need more frequent charging motion to keep it charged. You could even replace it if you want, and all by yourself. As a whole, as long as you do your regular motions during the day, the battery will remain charged and the watch will perform just as great even after ten years. It begins charging almost immediately when you put it on your wrist. Even if the battery has been fully discharged, only the slightest movement will begin to charge the watch. It is true that the watch doesn’t provide you with some additional features besides time and date tracking, but the self-charging battery is definitely a big plus, which is also ideal for nature enthusiasts who tend to spend months in isolated areas, and ideal for Arctic explorers who can’t use the sun to solar-charge the watch. A final consideration to make is that you shouldn’t keep it for more than a year without any movement. This is bad for the mechanism and if you want to use it after a year or two again you may find out that it won’t charge anymore and hence, won’t work at all. This isn’t a fault of the manufacturer, but simply because of the essence of the mechanism, so to prolong its life, keep using it actively and wear it whenever you’re working out, going camping, hiking, etc. It’s also waterproof so it’s ideal for swimming. Do you need a GPS feature? Check out our piece on how to choose the best GPS watches for more choices. Buying a survival watch is a difficult decision and must be thought through. This is a fine piece of machinery that must stick with you through the worst conditions so you mustn’t rush and buy on impulse. 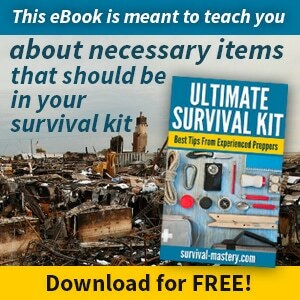 Below you can find some of the most important features that make a survival watch the best. When you’re lost in the woods or any other type of environment for that matter, the time perception is diminished. This means that you won’t be able to keep track of how long you’ve been lost and your only way to tell the time will be the sun (which is no good if you don’t know how to read it). A good watch must be accurate in doing its basic job: telling time. When you’re in the great outdoors there is going to be some humidity. You may fall in a pond, get caught in the open by a rain or simply sweat. Your watch must be able to resist all that and still work properly. Keep in mind that there are two types of watches: waterproof and water resistant. The first version is designed to resist being submerged in water while the second will only resist in situations where humidity is present but not excessive. Basically, most survival watches are either Quartz powered or mechanical. If they use Quartz to power the watch, you will need batteries to keep it running and this may be slightly off-putting because the batteries may die at the wrong moment, exactly when you need it most. And yet, these watches are a great option, because watch batteries don’t have to be changed that often (in comparison to flashlights, GPS, etc). Mechanical watches, on the other hand, don’t require any batteries – they only have to be wound to keep them going. They will never abandon you at the wrong moment, and if you take good care of them they can be useful for many years. There are also atomic watches, which may still require some remote connection. See our article on the best outdoor watches to give you more options. Considering the fact that a high-quality survival watch is quite expensive you’ll need to spend some time doing research. We hope that our reviews help, but if you can test certain watches before you commit to a purchase this would be fantastic. This way you can get a feel of how the watch behaves. Some customers may have a negative experience that happens to have nothing to do with the manufacturer or the product itself, but the fault could be linked to a factory fault. This may make you believe that the product isn’t worth it. To avoid such mistakes, find more information about the watch you liked the most and consider buying. Also, if you find any other great products that we missed, please don’t be shy! Tell us about them in comments!